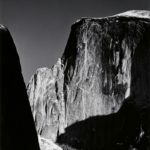 Ansel Adams auction | Skinner Inc.
Ansel Adams (American, 1902-1984)Moon and Half Dome, Yosemite National Park, California, c. 1960, printed later, sold for: $7,200. Photography offers an extraordinary variety of imagery often at a more reasonable price point than paintings and sculpture. If you’re a beginner collector or a seasoned one looking to explore a new art form, photographs are an excellent option and value.